Sometime around early 1971 I remember walking into a small local bookstore that sold books and magazines, but in used condition--mostly a place where people traded in their old periodicals for some minor compensation. I was just starting to become interested in comic books, and it hadn't taken me long to reach the point where I began looking around for back issues of the books I'd been reading--so this store seemed like it might ideal for that purpose if their stock included comics, which it did. This particular store really didn't get much business, so most of the time there were large stacks of magazines and comic books waiting to be looked through--a virtual treasure trove for a kid who had been recently bitten by the collecting bug. Most of those back issues were in good to very good condition, though I wasn't yet thinking about things like grading or even bagging--it was enough to just find a fresh stack of books that would add to my stash and allow me to read backward and get a little more comics lore under my belt. A good thing, too, since the store owner had a habit of literally marking down his merchandise for resale, taking a marker right to the cover of the book or magazine--and just for good measure, stamping the store's name and address there, as well (free advertising, I suppose). A practice that today would have me wincing in visible mock pain. 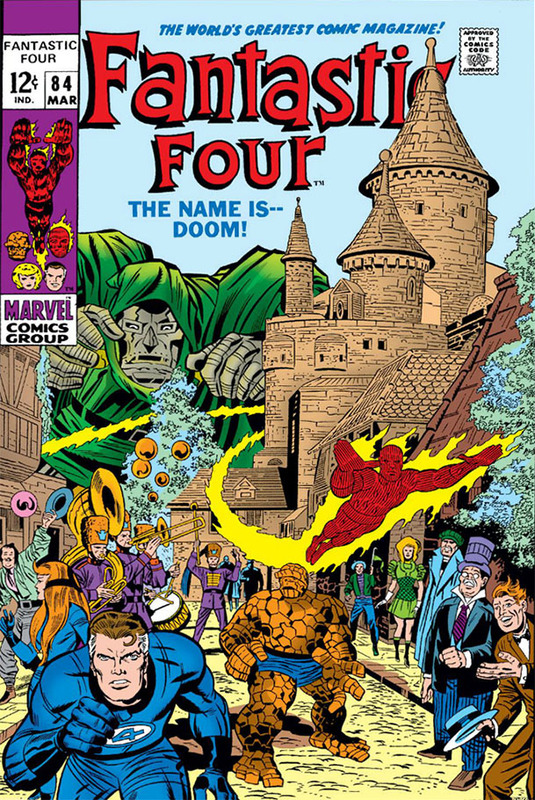 In about a year and a half after FF 84 saw publication, Kirby would announce his resignation from Marvel--which in a way sheds new light on this story, given how masterfully Kirby and Lee had transformed Doom over time into one of the FF's... one of Marvel's... most memorable and anticipated nemeses in the company's roster. 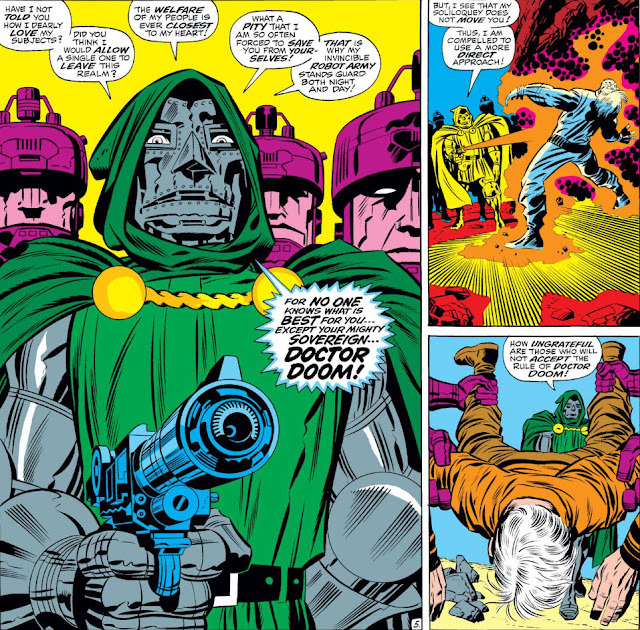 This story isn't my favorite Doom tale--but it's a fine farewell to the character from his creator, so much so that Doom arguably has the lion's share of scenes while virtually elbowing aside the title characters. And you'll find abundant examples here of Lee's robust dialog for Doom, a sort of final tour de force with one of his most dynamic characters--leaving no doubt that if there's anyone who can chew the scenery, it's Doctor Doom. 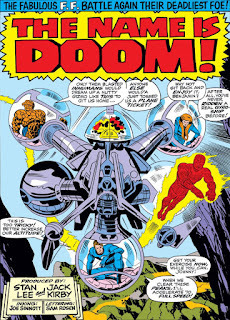 This initial issue of the four-part story mostly (if not entirely) consists of build-up, and in that it does its job well, thanks to Kirby packing it with a variety of interesting visuals which demonstrate this artist's proficiency at pacing a story and moving it along while taking into account the events to come. 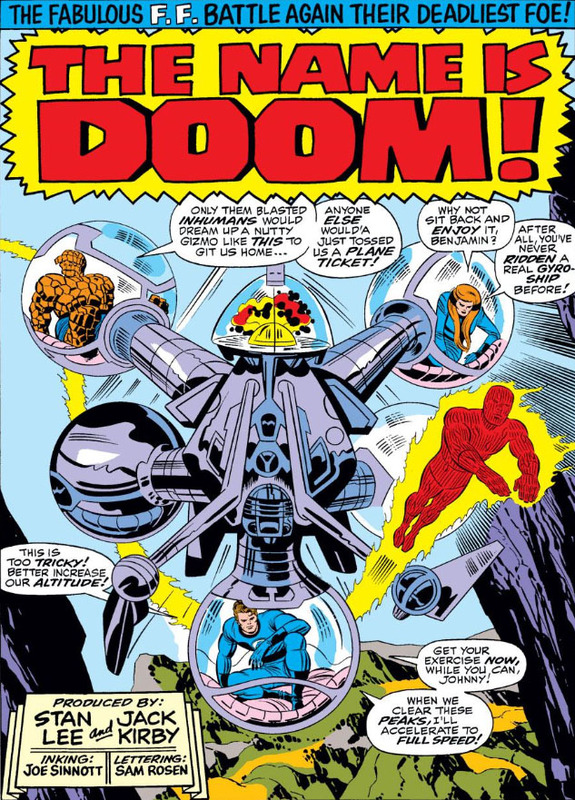 To start things off, that means catching up with the FF as they return from their last adventure in the land of the Inhumans--traveling in yet another incomprehensible vehicle that's seemingly designed with the sole purpose of making us want one of our own. 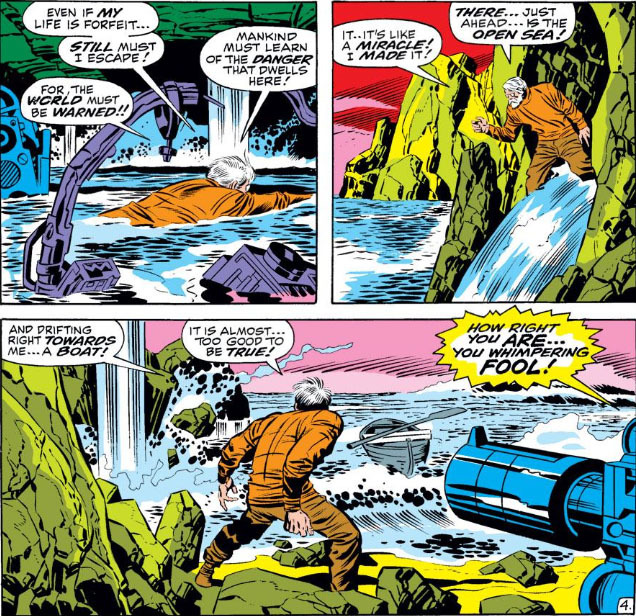 It naturally doesn't take the Fantastic Four long to run into the unexpected, which in this case takes the form of fighter jets from S.H.I.E.L.D. And the very recognizable pilot and co-pilot in one of those planes appear to be in urgent need to meet with the FF. Elsewhere, in a small European country, a man on the run frantically attempts to win his freedom. But despite the precautions he's taken--the knowledge he has of his escape route--he cannot evade the one who lies in wait for him. The one who continues to boast of a benevolent nature that doesn't exist. And so in just a few pages, the key players of this drama have all been assembled (with the exception of one, but that person's role in the story will become apparent much later). 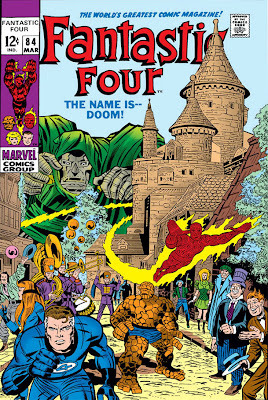 We know that the Fantastic Four will in some way be engaged in conflict with Doom again, but why? And aside from his usual stance of holding his kingdom and his subjects in an iron grip, what new plot is Doom involved with that has the likes of SHIELD on edge? In the mid-1970s, writer Steve Gerber began taking an interest in resurrecting the Guardians of the Galaxy from obscurity. 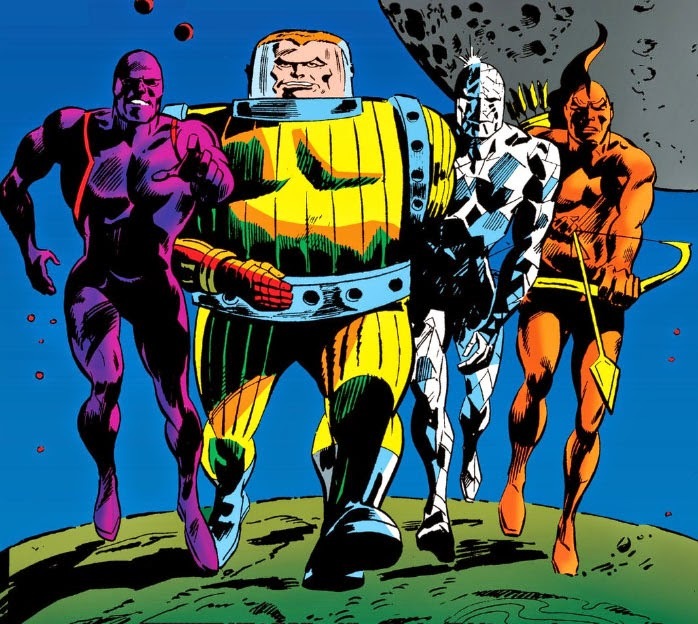 Last (and first) seen in their premiere issue in early 1969, the Guardians looked like they had their work cut out for them in what seemed to be shaping up to be a long and difficult struggle to free the human race from the murderous Brotherhood of the Badoon, a race of reptilian aliens who had finally succeeded in conquering the Earth of the 31st century and enslaving its population. The "Guardians of the Galaxy" were mostly the result of chance meetings between four individuals who crossed paths while trying to survive encounters with their Badoon attackers. Two were products of Earth colonies established on Jupiter and Pluto, where the colonists of each world were obliged to adapt to the extremes of those planets--respectively, Charlie-27, who gained massive bulkness and strength in order to survive the gravity and pressure of Jupiter, and Martinex, part of a genetically engineered crystalline race who possessed heat/cold deploying abilities. Charlie, a member of the space militia and returning from a six-month solo assignment, returned to find Jupiter captured and was forced to teleport to Pluto, where he found Martinex attempting a last act of sabotage before making his own escape. Fleeing together, the two teleported to Earth and found two others improvising their escape from captivity: Vance Astro, an astronaut of the year 1988 whose thousand-year flight to another world was turned into a cruel joke when he found that humans had beaten him there, thanks to faster-than-light technology perfected just 200 years after he'd launched from Earth... and Yondu, a native of the world that was Astro's destination. Astro can harness psychic energy (a heck of an ability for an astronaut to pick up); while Yondu possesses "yaka" arrows made of sound-sensitive material that allows him to direct their course with a whistle. 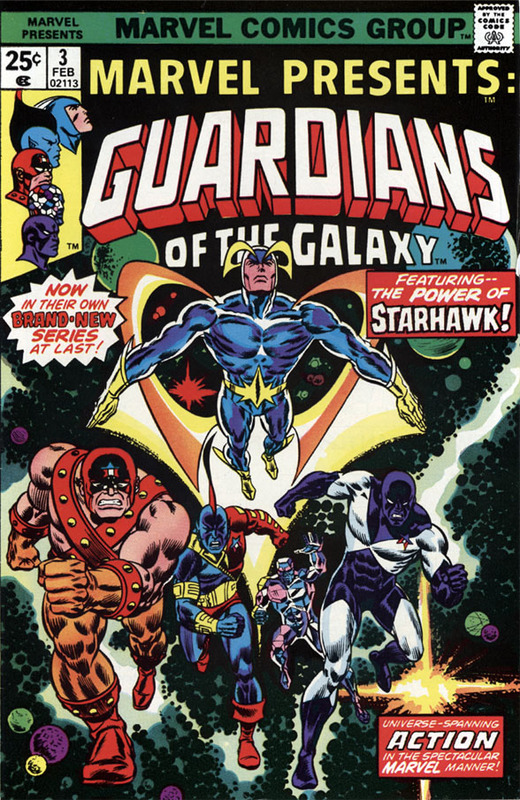 Unlike Captain Marvel, a character who had used his premiere in Marvel Super-Heroes as a stepping stone to a second appearance in the book and then to his own series, the Guardians remained in limbo; but five years later in 1974, Gerber dusted off the team and dealt them into a story arc in Marvel Two-In-One where they joined 20th century heroes travelling from the past to retake one city (New York) from the Badoon, with Astro, Yondu, and Charlie-27 re-outfitted (and, in Charlie's case, downsized a bit) to give them a more distinctive presence on the team. It was a promising new beginning for the Guardians that served to jump-start the concept; and a year later, Gerber took it a step further by scripting a plot by several writers (including himself) that brought the Guardians into the 20th century in search of historical records that might indicate how Earth had fought off the Badoon in 1968. Unfortunately, their new friends, the Defenders, can be of no help--in that regard, at least. Take Dr. Strange at his word, however contemplative it might seem, since that story segues to a four-issue arc in The Defenders that has Strange and his allies returning with the Guardians to the 31st century, resolved to put an end to the Badoon threat--though it's more accurate to say that Strange sets the wheels in motion for the human race to reclaim its own destiny. 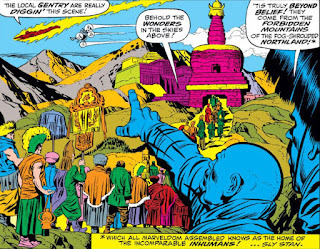 With the mystic liberation of enslaved humanity, the Defenders story gave the Guardians the momentum that the MSH tale failed to ignite and lead the team to its own series, albeit in the Marvel Presents "feature" book that provides the group with a generous ten-issue run that gives it every chance to establish a decent following. But what are these resistance fighters to do when their long struggle comes to an end? But this time, it's the star-spawned Nebulon and a mystery companion, rather than the dread Dormammu and Loki, who might be the ones manipulating the two teams for their own ends. But let's not get ahead of ourselves--because while there (again) might be some truth to that, there are other factors involved that make the situation more complex than two teams of heroes acting as pawns for those who have deceived them. In fact, as well as writer J.M. 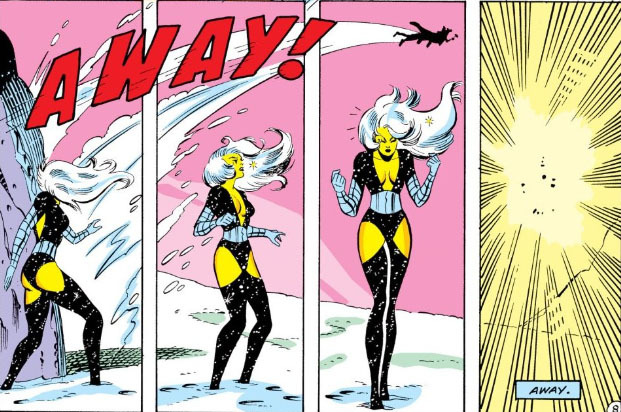 DeMatteis structures this story, it may take awhile for you to be certain of any villainous intent on the part of Nebulon and the female who will be introduced as Supernalia. 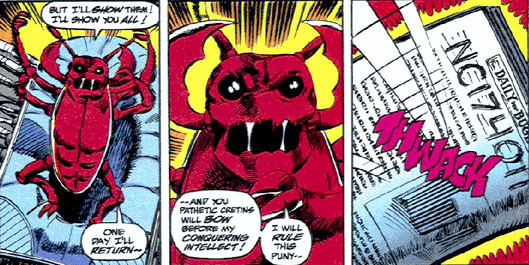 DeMatteis has a habit of playing such a card close to his vest, and often giving the reader much more to think about than simply good vs. evil. The story is also nicely rendered by penciler Al Milgrom, who often needs a strong inker to refine his work that showcases his otherwise good instincts at how a story plays out and the abilities of the various characters involved. Here, it's Jack Abel who does the lion's share of the inking, though the credit reads "Jack Abel and Crew." It would have been nice, as well as an extra perq for the Annual, if the issue had been supplemented with a listing of the additional inkers involved in the work; I found myself doing a lot of guessing as to who could have been supplying the finishes in some of the panels where Abel's touch was either missing or it appeared he was getting some assistance, and it might have been fun to go down a list of credits and see how well (or how wrong!) my guesswork panned out. Since the cover renders moot any possibility of Nebulon being the surprise villain here, the story can safely open the curtain with him first thing, as he's being dressed down by a superior following a trial that laid bare his past transgressions on the planet Earth. As we can see (and which has already been revealed in the prior instances depicted here), Nebulon's guise as the so-called "Celestial Man" hides his true nature as a member of the race of creatures such as the one present with him here. Stripped of half his power, Nebulon is given a choice of either being exiled to Earth in his humanoid body, or being executed--the latter option considered by his superiors to be by far the more honorable choice, yet a choice Nebulon strongly refuses. And so Nebulon's final judgment is decided. At first, Nebulon reacts with rage, his first instinct being to take revenge against the Defenders for his fate; but almost immediately after embarking on that course of action, Nebulon realizes that he has only himself to blame, and teleports to the Himalayas to contemplate his situation in isolation. It's an important scene in the course of this story, though the reader won't yet realize it as such. And speaking of the Himalayas, look who else has come to do a little thinking there. 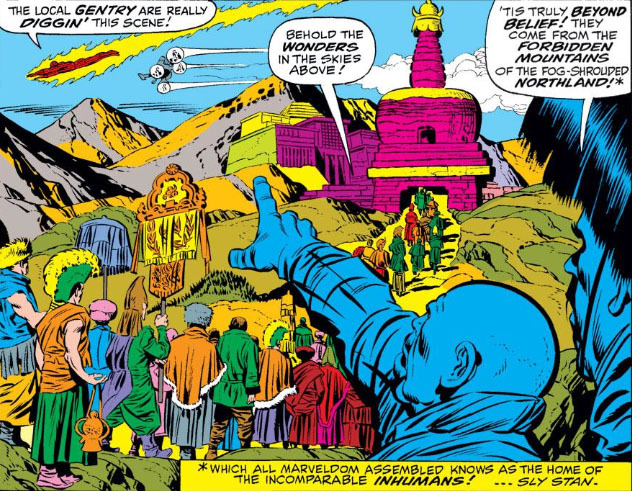 With Thor and Nebulon ending up in the same place and time by coincidence, it's easy to get the impression that the Himalayas absurdly cover only a small distance, instead of being a vast expanse of mountains extending roughly 1,500 miles (which Madame Medusa probably knows from experience). Regardless, Thor's curiosity gets the better of him, and he strikes up a conversation with this stranger--and by the time the tale is concluded, we learn how the Avengers are to be folded into this story. The Avengers--and one other. Supernalia--whoever she is--doesn't look at all pleased, does she? Care to take a guess as to which group she'll be headed to? 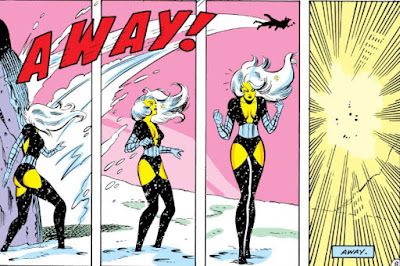 When Strikes The Scarlet Beetle! 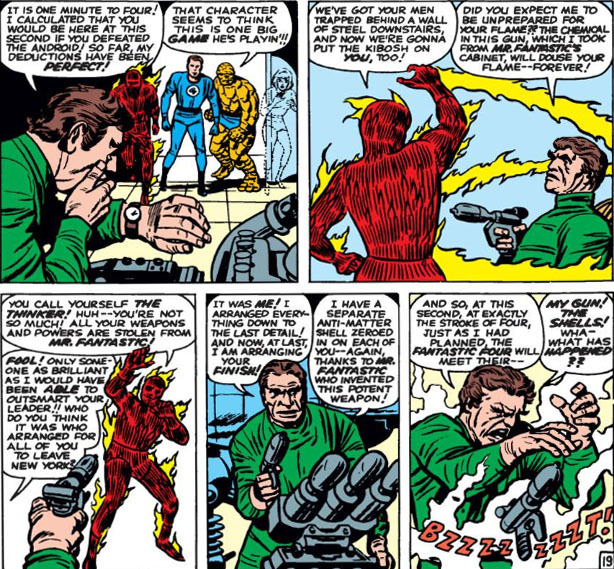 Every once in awhile in comics, it's always fun to encounter a new antagonist for our hero(es) who's played for laughs--a list of troublemakers that's included, to name a few who have been profiled in the PPC, the Impossible Man, Captain Ultra, the Black Fox, and of course Fabian Stankowicz, as well as the hapless Rasputin. And who could forget the utter chaos of the Defenders' membership drive from hell that saw trouble from both hero and villain? We also have writer Peter David to thank for making even more serious villains capable of evoking a chuckle or two from readers--foes who at times exchanged rant for wit, but were no less deadly. 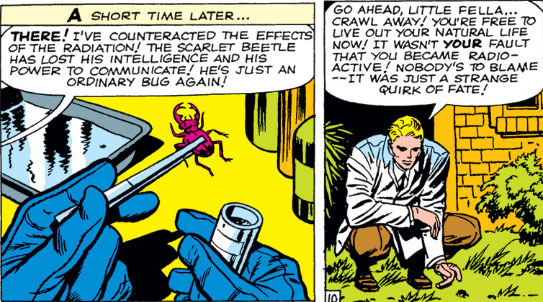 And then... *sigh*... then there's the Scarlet Beetle, one of the most minuscule would-be conquerors ever, who dates all the way back to 1963 and was--is--obsessed with making insects the masters of Earth. Mock the Scarlet Beetle as you will, but his tenacity, arrogance, and sheer presumption have been long-standing trademarks of also-ran villains of the more human variety whose reach, like the Beetle's, exceeded their grasp. The Beetle might remind you a little of Salamar, the Sustainer, the sinister albeit mechanized oversized crab that lurked in the sunken ruins of Atlantis and turned out to be the construct of Namor's fiendish cousin, Byrrah. 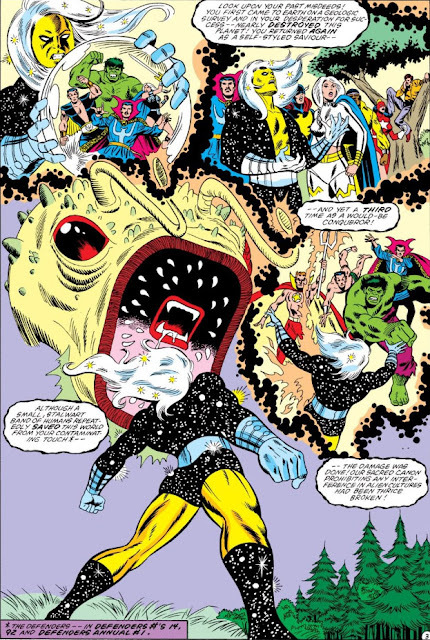 In the Beetle's case, it's no surprise that he was not only sentient, but intelligent, since such monsters were plentiful in not only Tales To Astonish but other "Tales" mags which were slowly transitioning to featuring super-heroes; and of course the scope of the Beetle's plans was on a far greater scale than Salamar's. 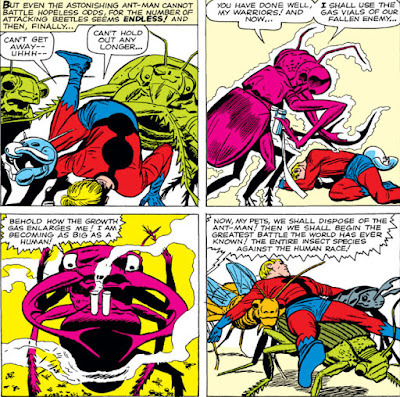 The Beetle was mainly a foe of the Ant-Man--and though he would also encounter Scott Lang in that identity, he began his reign of terror by battling Henry Pym, who was just getting his feet wet as Ant-Man and was still using gas vials on his belt to change his size. In essence, the Beetle's plan to conquer the world isn't a bad one, since the number of insects on the planet could overwhelm the human population if guided by a sinister mind like the Beetle's. 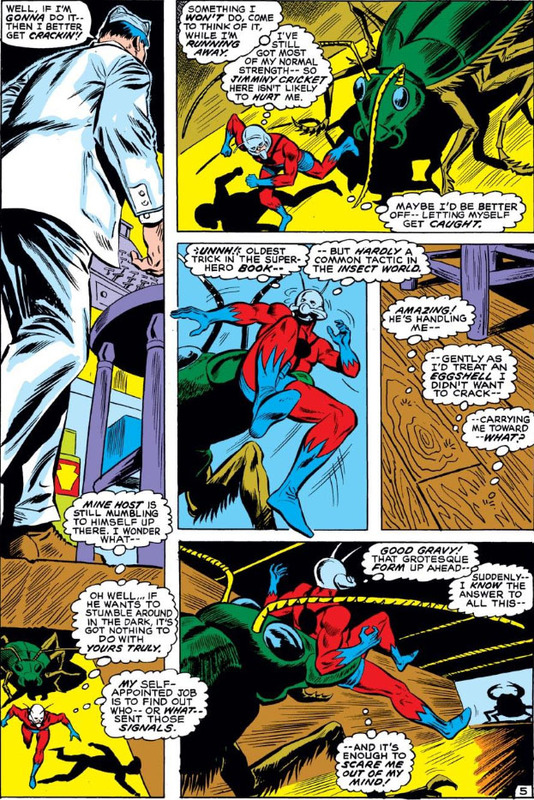 And Pym learns as much when, encountering the Beetle in his lair, he inadvertently hands his foe the means to make him even more of a threat. 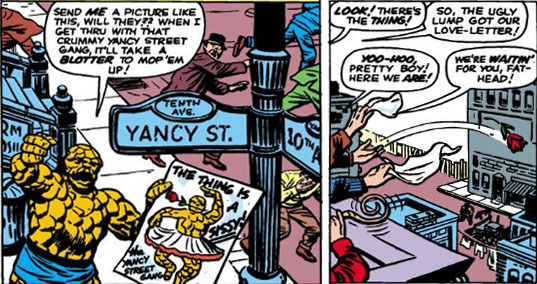 With Pym out of the way, the Beetle proceeds to begin his invasion, and indeed the city's population seems to have no defense against the Beetle's well-thought-out plan of attack. 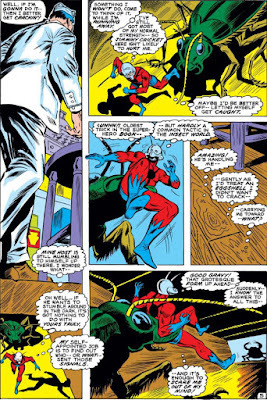 But Pym eventually escapes captivity and confronts the Beetle, luring him into a toy store and using the "weapons" at hand to pull victory from defeat and end the Beetle's threat, seemingly for good. 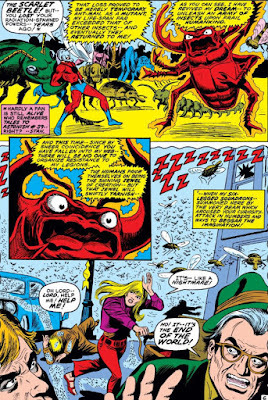 But in a 1972 story by Roy Thomas, the Scarlet Beetle returns, as malevolent as ever--and though Pym would face the creature once again, a dejected shop owner turned arsonist named Wilbur would also play a crucial part in how things play out. It doesn't look as if the Beetle's changed his approach to conquest--nor does he really need to, providing he doesn't allow Pym the chance to upset his plans. 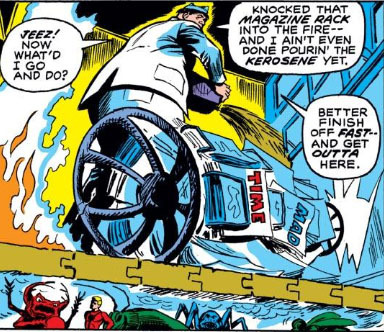 And when Pym appears to have foiled him in one aspect of his scheme, the Beetle handily adapts and perhaps becomes even more dangerous. 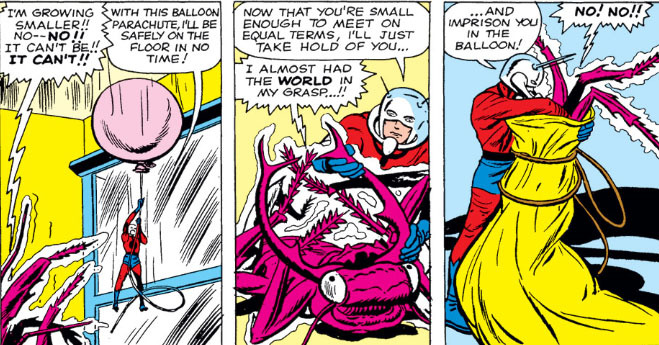 Pym deserves a little credit for at least making sure that no can take advantage of his size-changing gas anymore, though it's clear he hasn't covered all the bases as far as having his abilities co-opted. His cybernetic helmet would represent a significant advantage for the Beetle, since it was Pym's control over the ants that helped him prevail against the Beetle in their prior battle. 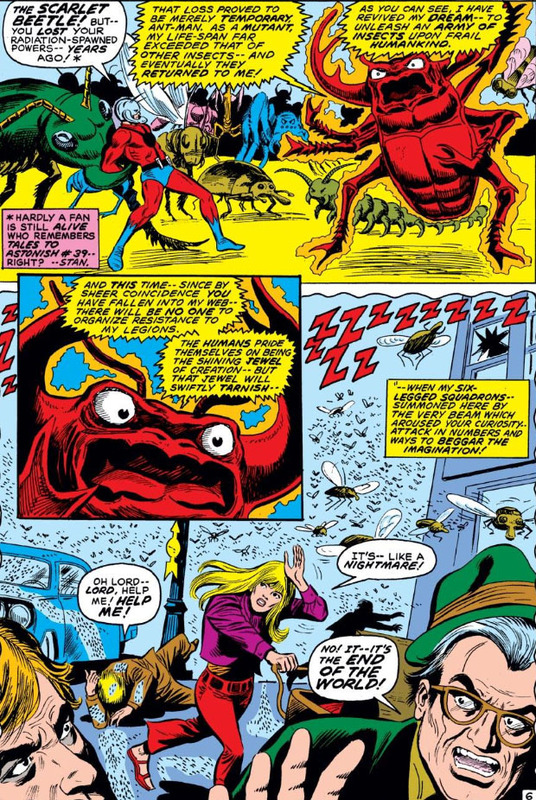 Fortunately for Pym, Wilbur has plans of his own--which not only manage to save Pym's life, but also bring an undignified end to the Scarlet Beetle. 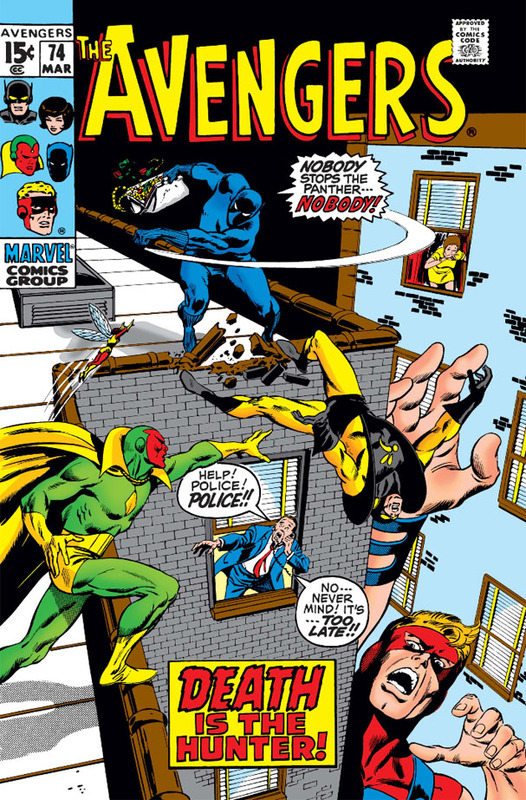 Previously, we took a look at a letter from Avengers reader Philip Jones, who in 1970 critiqued a story from issue #74 of the book which concluded a two-part tale featuring the sinister Sons of the Serpent. Jones's letter was given the entire letters page to make its points, which writer Roy Thomas would respond to personally in the letters page of the following issue. 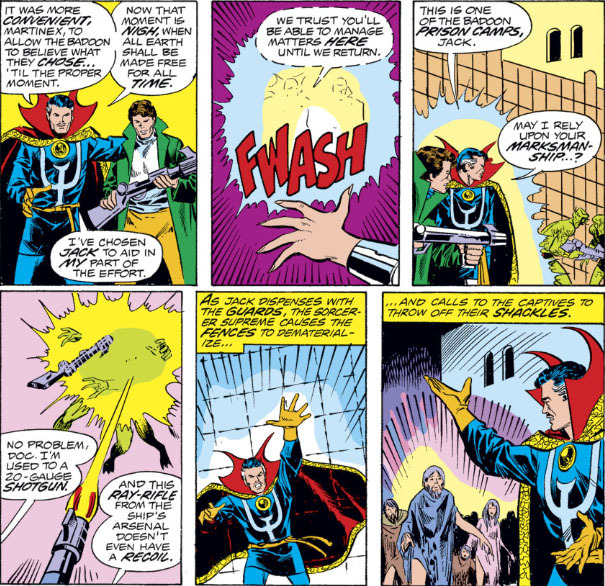 In essence, Jones was taking issue with scenes throughout the story which he felt were given racial subtext by Thomas and artist John Buscema, either in ignorance or otherwise. To follow up, this post presents Thomas's reply in its entirety. If you haven't yet checked out the earlier post on this subject, which goes into the letter in detail, you may wish to do so before reading what Thomas had to say on the matter, in order to have a balanced picture of the entire exchange and to put Thomas's comments into proper perspective. Though before you make the assumption that you're getting into a hornet's nest here, you'll find the tone in both men to be quite civil, albeit with strong words and very pointed observations. As the preface to Thomas's column intimates, "praise and condemnation" can exist side-by-side in civil discourse; but that said, Thomas is quite blunt in his reply, and he offers a strong defense for the approach he took with the story. Overall, it's an interesting clash of impressions during what was at the time a growing understanding of race relations emerging from the late 1960s. It's 1970--Can You Dig It? 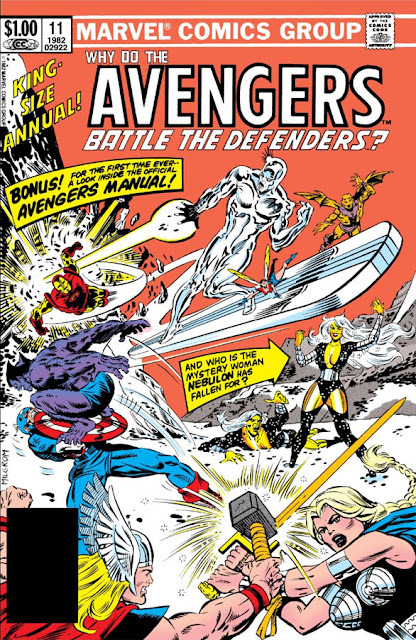 Avengers #74 capped a two-issue story that saw the return of the Sons of the Serpent to the book, the insidious group of zealots whose mission is to purify the nation by purging it of "the unfit... the foreign-born... the inferior," while carving out a power base for itself (or, more to the point, for its leaders). How the Sons of the Serpent ever gained credibility for the supremacist message that they were pushing is one of the all-time head-shakers in comics lore, as violent as their operations are and as transparent as the group seems to be as a hate group. Dressing and accessorizing your group members in the motif of snakes practically screams "ploy," given that the term "serpent" is often associated with someone who gains your trust only to betray it; and openly basing your name and your mission on the biblical story of Adam and Eve being driven from Eden by "the first serpent" (thus making you the sons of the serpent) seems counter-productive, since there probably aren't many of us who are cheering that serpent for driving us all from paradise. That said, these were the late '60s/early '70s--and with racism still rearing its ugly head, incredibly, nearly fifty years later, you can imagine how rampant it was when this story was published, and how much it remained a hot-button issue for the Sons of the Serpent to exploit. The Avengers story gets its momentum from two developments. One is in the form of the inflammatory national broadcasts of rival late-night talk show hosts Montague Hale and Dan Dunn--"rival" in the sense that both have strong but opposing views of equality and civil rights. Hale, having recently lost his sponsors and then his show after having called for an investigation of the Sons of the Serpent and subsequently fallen victim to them in a street attack, begins to appear on Dunn's show to debate the issues. Dunn, for his part, is a known bigot--and so the broadcasts are often fiery with no meeting of the minds, rife with innuendo and barely restrained hostilities. The other development takes its leaf from the prior clash between the Sons of the Serpent, where Captain America was taken captive and a double took his place and appeared to support their cause. In this new story, it's the Black Panther who's captured while trying to infiltrate the group--and his double begins pulling criminal jobs and appears to have turned militant, forcing the Avengers to step in. Eventually, the Sons will unmask their "double" of the Panther on live television--and his well-rehearsed open support of the Sons, as well as being revealed as both black and guilty of his crimes, is designed to inflame the minds of those in the country who are riveted to these broadcasts. There's one final similarity which this story shares with the Sons' prior appearance. In that earlier story, the so-called Supreme Serpent was revealed to be a foreign enemy named General Chen, whose goal was to turn Americans against each other; while here, the culprits are unmasked and shockingly revealed to be both Dunn and Hale, who shared the identity of the Supreme Serpent and schemed for power together. Both stories clearly offer words of warning on the dangers of being misled by those who appear to have your best interests at heart but who are only using you as a means to an end--a practice which clearly has survived to this day. I interject some very brief comments following the points raised by Jones and preceding those of Thomas, who can certainly address Mr. Jones's points without my 2¢ getting in the way. As for the letter itself, it seemed appropriate here to expand on a prior post on the subject and convey Jones's words in the same format that a reader in August of 1970 was presented with them, only with a little digital help from 2017 that first presents the panel(s) that Jones is referring to, with each panel followed by Jones's comments. It would probably be helpful to read the issue in its entirety first, since you'd be getting the whole story rather than carefully selected excerpts that are given their own context courtesy of Jones--but regardless, hopefully you'll find it an interesting glimpse back at this period of time where such thoughts often found their way into the national conversation. Following the shocking attempted takeover of the world's computers by the Vision, whose judgment was impaired by a damaged component in his skull as well as a link-up with an advanced and alien A.I., there was understandable concern about what the repercussions might be when the government began an investigation into the matter. Normally, that investigation would include other governments of the world whose systems were also compromised by the Vision's incursion; but for an incident that would typically be dominating the news cycle for more than a few days if not weeks to come, both the Vision and his wife, the Scarlet Witch, as well as the rest of the Avengers, will find this to be the most fast-tracked and surreptitious investigation of a world event ever (not) recorded, as well as one of the least consequential, thanks to writers Roger Stern and Steve Englehart who are presumably working in tandem to make sure the Vision and Wanda are freed up (in terms of both time and, it seems, federal custody) to return to their own affairs in their upcoming 1985 limited series. 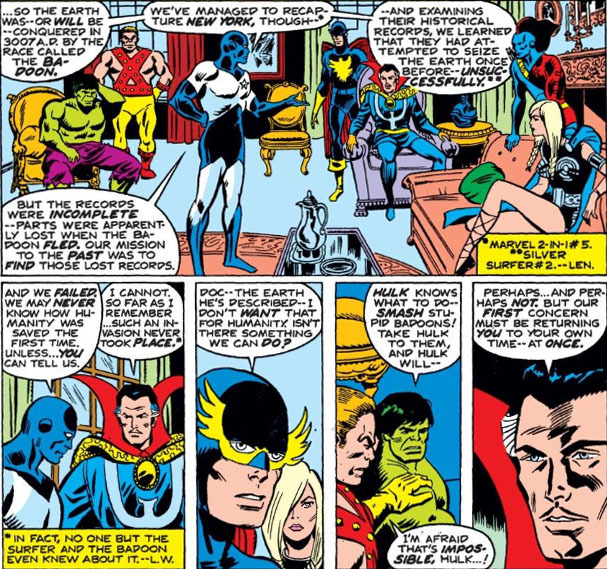 Yet, immediately following the incident, there was a great deal of concern among the Avengers for their teammate, who was taking full responsibility for his actions and pledging his full cooperation to government authorities--particularly the National Security Council, which was responsible for granting the Avengers their priority clearance and was now in the hot seat due to the security breach that was made possible by such clearance. 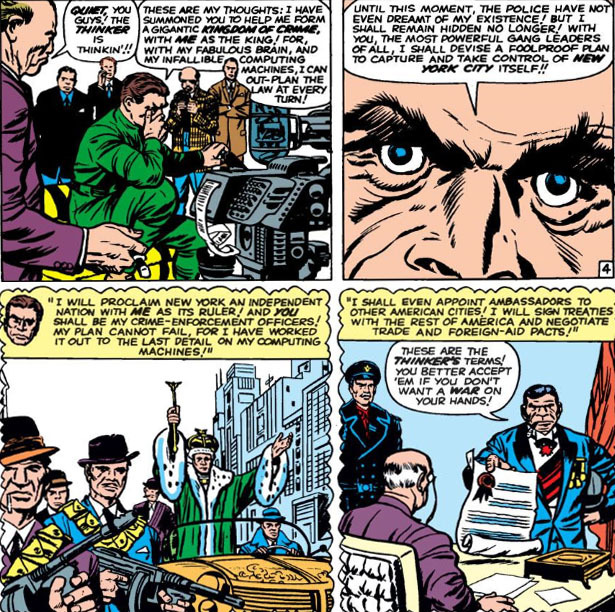 Thus we find Raymond Sikorski, the Avengers' most recent liaison to the N.S.C., meeting with one of the military's brass, who's furious at the fact that the Avengers haven't yet been held accountable for their illegal actions here. Sikorsky of course is speaking of Henry Gyrich, who more often than not overstepped his authority with the Avengers and tended to make judgment calls for the procedures he felt they should follow. Sikorsky, in contrast, seems to understand how the Avengers' day-to-day operations would be atypical from standard government procedure--their powers and abilities, as well as the selfless character of their members, making them suited to act autonomously during a crisis while fully keeping the government in the loop. 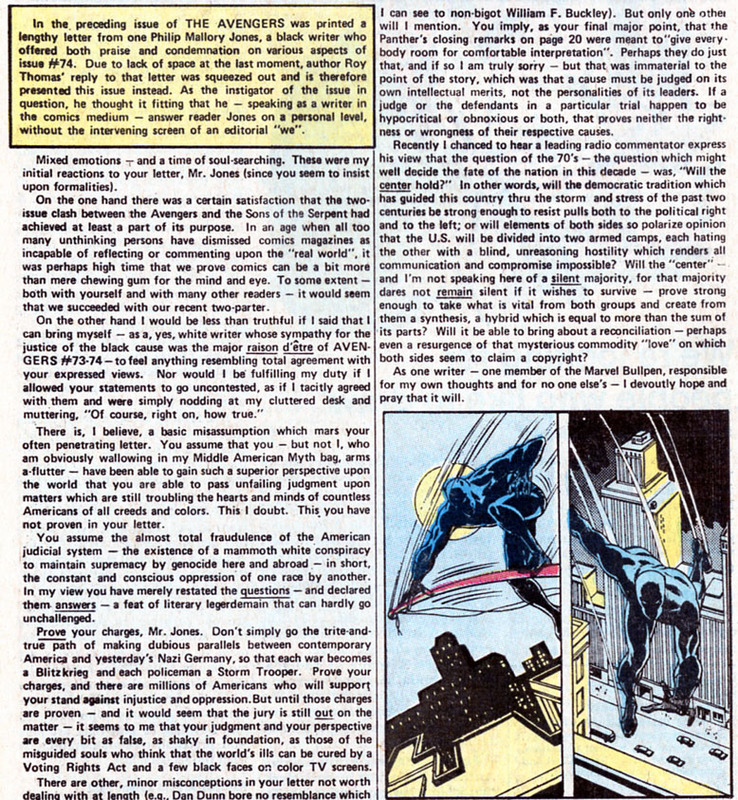 This incident would be a serious breach of the Avengers' authority, of course, with cause for a serious response from the feds; but to his credit, Sikorsky sees the need to proceed carefully until all the facts are known, and, even then, to work closely with the Avengers in resolving the situation. The Golden Age Of... The Vision! One of the more interesting storylines involving the Avenger known as the Vision laid a lot of groundwork before reaching its resolution, stringing the reader along for over twenty issues of The Avengers while dropping clues and subtle developments that had us all wondering: What is going on with the Vision? The short answer is that he was planning take control of the world. But it's the how and the why that would have writer Roger Stern creating an entirely new approach to the character, setting the stage for future developments for not only the Vision but also a deeper focus on his relationship with the Scarlet Witch as well as the possibility of a family life. 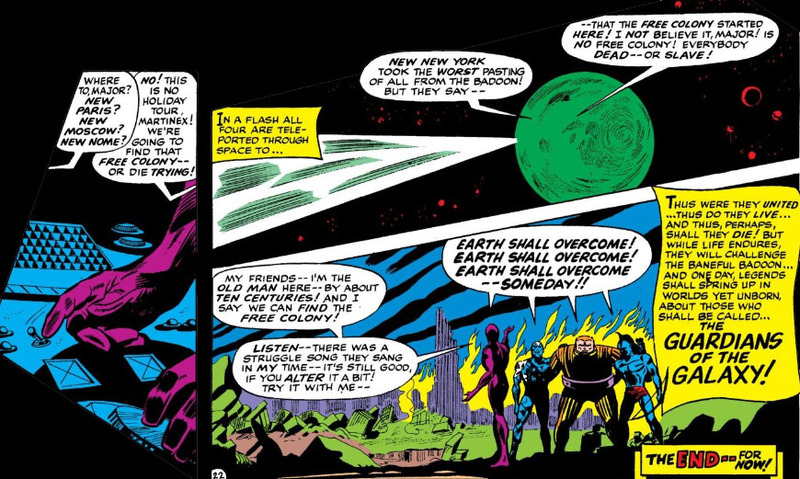 But we should start at the beginning--and that point arrives during a dramatic conflict between the Fantastic Four and Annihilus, the despotic spawn of the Negative Zone. In a mad bid to destroy two universes, Annihilus has established an impenetrable barrier near the Baxter Building, one that required the special talents of the Avenger whose powers were best suited to breach it. Unfortunately, no one was aware at the time that this barrier was actually a "null-field," a term which implied that anyone successful at piercing it would suffer the consequences. Consequences which in the Vision's case meant total deactivation, or possibly even death. 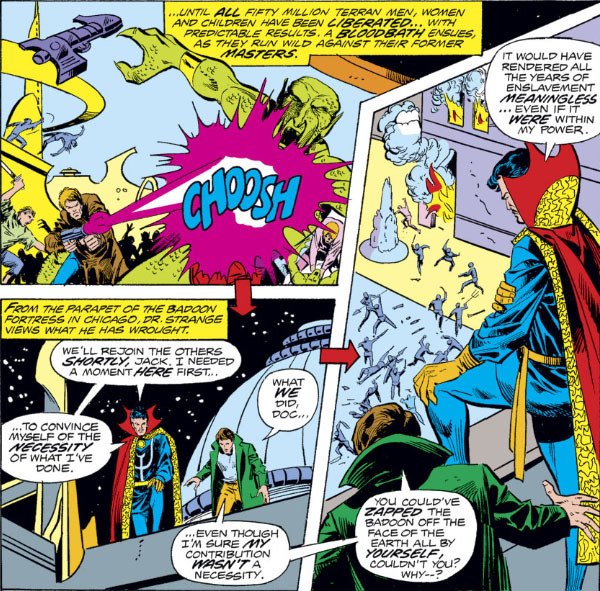 But despite appearances, things would get even more complicated for the Vision, though from his perspective he would likely claim that this incident gave him a new lease on life. But eventually that would mean sacrificing that life for the good of the world. When it comes to recycling, it looks like comic books had a head start on environmentalists, though for comics writers it was more a matter of successful concepts that were dusted off and adapted to later stories. 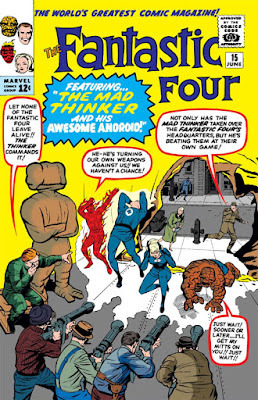 Take the opening pages of the Fantastic Four issue which featured the team's first clash with the mad Thinker, in a sequence that can't help but take you back to issue #1 and the introduction of this famous foursome. It's a dramatic opening that still works, over a year after it was introduced. 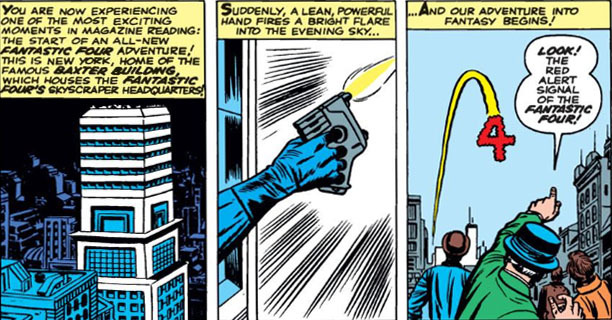 Here, however, we have the advantage of knowing all about the characters who are responding to the alert and converging to meet--and there's also the familiar presence of the Baxter Building anchoring the scene, the official headquarters of an established team that's now riding high in comics circles and can still generate excitement and interest in being summoned by a flare gun. There are other elements in this story that are the result of being tweaked to one degree or another and reused--such as the team leaving their headquarters and striking out on their own, as they did when they went bankrupt. This issue would also get the ball rolling on other concepts that would be retooled and used later, such as the invasion of FF headquarters by criminals or villains, or the team having their own devices and weapons used against them. But in this classic issue, it's the Thinker that the story has us focus on, the calculating planner who makes use of his computers to deduce his next move down to the second and take into account anything or anyone who would seek to stop him. The Thinker's ability to advance his agenda is really dependent on collating the data that his computers gather and mapping out the steps he needs to take, based on certain things taking place at a certain time (or not taking place, as the case may be). Yet the whole point of uncertainty is that you cannot eliminate it or predict it, however careful and meticulous you are in your calculations--but just try telling that to the Thinker. It's quite a claim the Thinker makes: "Nothing has been left to chance!" That's presuming that he's isolated the uncertainties involved and based his calculations only on the events and incidents that will occur without fail. Credit where credit is due: if he can pull that off, his programming skills are far ahead of his time. 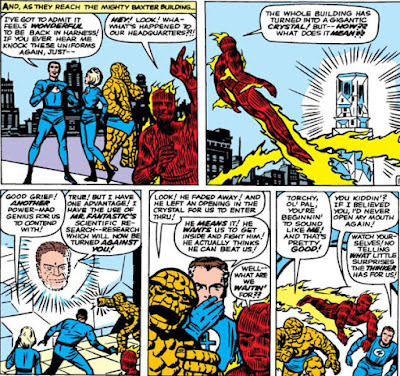 Yet, all things considered, the Thinker comes off as a third-rate villain in this tale, in spite of how far his planning takes him in going up against the FF. 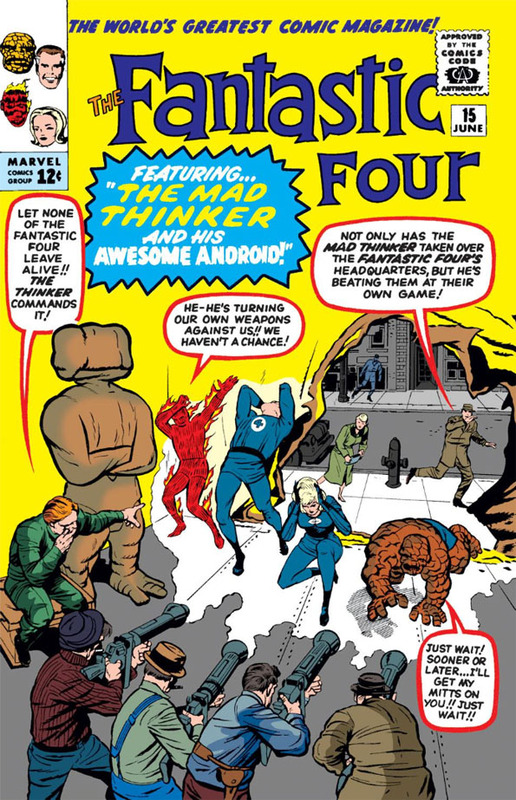 We know in hindsight that the Thinker will go on to become a deadly threat to be reckoned with--and while it may not seem like it, his first clash with the Fantastic Four will open many doors for him in that regard. Speaking of our foursome, we'll see in this story their first exposure to battling organized crime, a theme that Amazing Spider-Man would be more successful at integrating into its plots but which the FF would be bound to encounter in their line of work. We'll also get our first look at the Thinker's talent with androids, which would make him quite formidable against the FF as well as other super-powered beings he would later come into conflict with. But what's his immediate goal here and now? He doesn't exactly mince words with the crime bosses he's gathered to hear his plans. I can guess what some of you are thinking: It's amazing that the Thinker could find a crown big enough to fit that head of his. Mr. Fantastic: A new position in a New England electronics firm as part of their R&D division. Invisible Girl: Starring in a Broadway production after being approached by a producer who's been on the lookout for his next star. 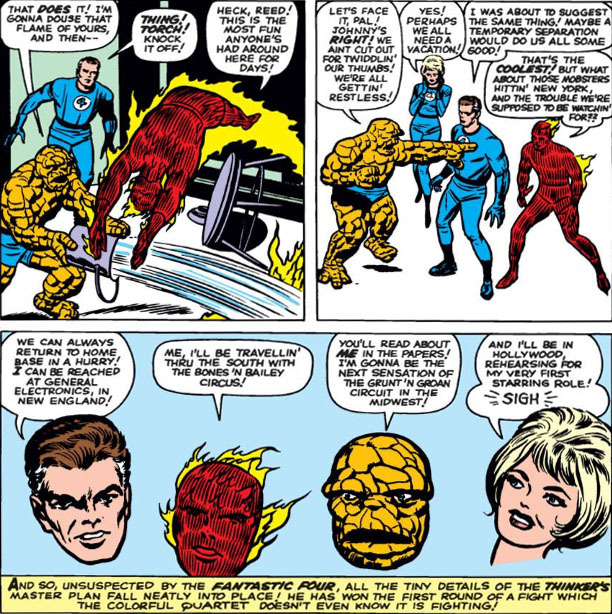 Human Torch: Becoming a circus performer, thanks to one of his cousins who's fallen on hard times and asks him as a favor to become the star attraction in his show. The Thing: A new star in the wrestling ring--his first exposure to the professional wrestling circuit, which we know would later become a fallback career he would turn to in many future stories. It so happens that all of these decisions are mulled over just as the FF have hit a lull in their activities--and so they all treat their offerings as a vacation of sorts, and off they go. 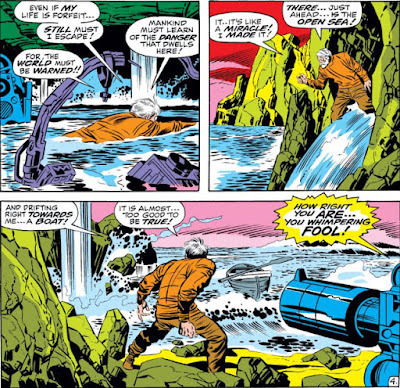 The second part of the Thinker's plan involves a meteorite that crashes into the New York bay (those are some computers--are they linked into NASA? ), causing a tremor that damages the city's power grid and wreaks havoc with repair crews. While the city is in crisis, the Thinker and his men are ready to take advantage of the situation as they penetrate their foes' headquarters. Meanwhile, checking in on the FF, none of them are exactly thrilled with the choices they've made. (For whatever reason, Sue's choice has been revised to replace Broadway with a trip to Hollywood and have her starring in a sci-fi film.) But, returning home, they're greeted with quite a site, as well as a deadly challenge. 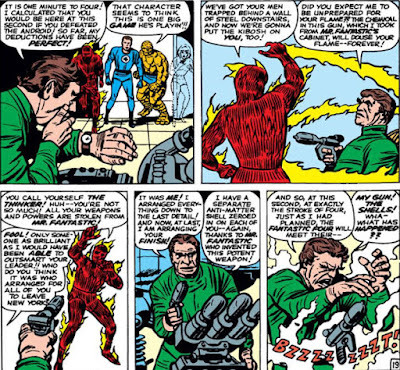 The Thinker is true to his boast, utilizing the FF's own building defenses as well as the many devices found in their labs to halt the FF's approach to the 35th floor--but the team makes its way through, while also dealing with the crime bosses who were armed with weaponry from Reed's armory. That leaves one piece of research which Reed was just getting started on--research notes that have now been realized in a hulking android that will also go on to make future appearances. So far, it doesn't look like the Thinker's plans are panning out, does it? 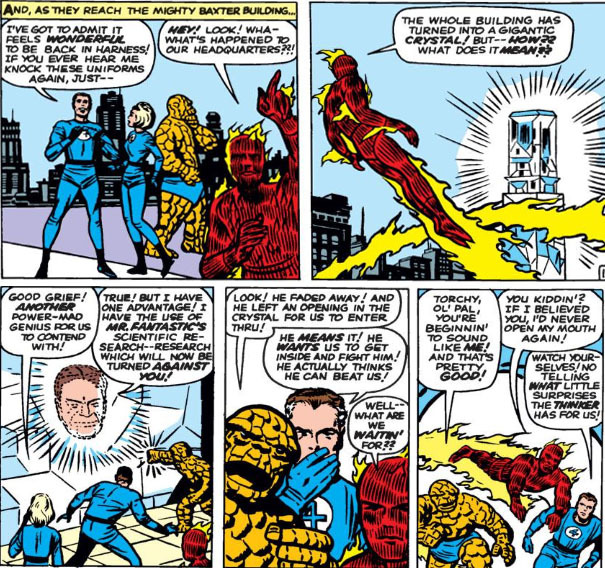 Things look especially dicey for him when the FF confront him--after all, if you boast that your calculations take into account the smallest detail and leave nothing to chance, why would you need a contingency plan? For all the good it does him. It seems Mr. Fantastic isn't such a slouch in the planning department himself--and all he needs for his calculations to come off without a hitch is a fellow professional whose motto is "Neither rain, nor sleet, nor snow, nor super-villain..."
It's off to the hoosegow for the mad Thinker--who might want to give some thought to all those crime bosses who are going to insist on joining him at his table in the prison cafeteria. The Triple Threat of... The Terrible Trio! The Stolen Destiny of... Star-Lord! The Mastermind Of The Master Mold!